In 1852, John Reed Hilliard bought ten acres of farmland in western Franklin County from Hoseah High and Abraham Wendell. Geographically, the Hilliard area is between Big Darby Creek on the west and the Scioto River on the east. Originally called Hilliard’s Station, the town grew around the railroad route of the Piqua and Indiana Railroad station, which bisected the former Hilliard farmland. Hilliard’s Station served as an ideal shipping point for agricultural products going to market and supplies coming to the farmers in the area. The original Hilliard area was platted by John Hilliard on September 1, 1853. Until the mid 20th Century, the railroad station and Main Street were the town center. In 1854, a post office was established in Hilliard’s Station and the word “Station” was dropped from the town name. The Village of Hilliard became incorporated on July 13, 1869 with a population of 280 residents. In 1886, the first railroad station was built on the north side of the tracks, west of Main Street. It remained there until 1962 when all railroad services ceased. The original train station has been restored and remains in Hilliard’s historical Weaver Park. The original platted area contained a mix of residences and businesses of varying ages and architecture. The construction of three large residential subdivisions in the 1950s brought explosive growth to Hilliard. The connection to the Columbus regional sewer and water systems in the 1960s opened up the area to development. The Village of Hilliard gained official city status from the Secretary of State of Ohio by attaining a population of 5,633 on December 12, 1960. With the completion of the I-270 Outerbelt in the 1980s, a second wave of explosive growth came to the area. Land uses in Hilliard continue to be a mix of residential and commercial development. A rich heritage of residential structures and architectural styles can be found in the historic district along Norwich Street. 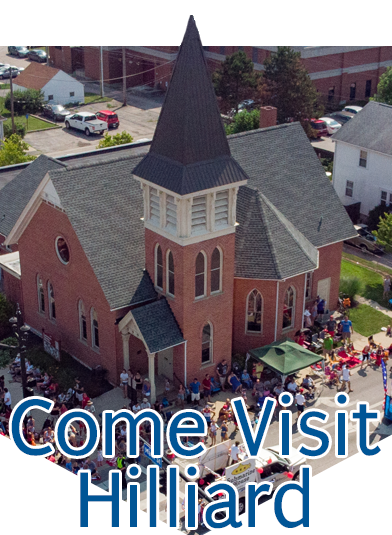 For more information, contact the Hilliard Ohio Historical Society at 614-876-5880.